These pages are dedicated to my former workhorse: my 1988 Dodge Shadow ES. It was my daily driver from the summer of 1995 through November 2002, and was a great car. The body simply fell apart on it (rust, paint peel, etc); I could not justify the work needed to fix it right. Goodbye. Jason came and picked up the old girl today. I stripped everything off that I thought I could use for the CSX or maybe sell at some point. The power train came out fairly easily through the bottom. I will probably put it in the CSX before that motor seizes, while I build up a good one for it. Well anyway, it’s all over now…. R.I.P. I have decided to retire the old beast. The right rear brake line rusted through last week (not too uncommon). I spent several hours trying to patch it, but more and more of the lines crumbled away and all the fittings twisted off as I tried to remove them. If the body on this car wasn’t in such horrible shape (five shades of peeling red paint on a crooked body), I would certainly just fix it. This was simply the final straw for me…and excuse to get something worth fixing. I will be pulling the powertrain and stripping the body for spare CSX parts. After that I will part what’s left out and have it hauled away. It’s sad, as I have been driving this car for the past 7 years, but there comes a time when you just have to give it up. I learned a great deal about cars through the old-timer, and its memory will live on here. After almost exactly 2 months of neglect (one of those spent waiting for parts), I finally got the trans rebuilt and installed. The rebuilt went well, once I broke down a bought the right tools. If you are going to work on one of these, buy yourself a pair of snap-ring pliers with flat, knurled ends and a decent, small gear puller. You’ll be glad you did. I bought both from Sears and they worked great. The puller made quick work of the front (bell housing side) intermediate shaft bearing as well as the outer race in the extension housing and the pliers made quick work of those annoying snap rings. The rest of the outer races came out with a hammer and punch. The inner races are a bit more work, but aren’t bad as long as you are careful. Since there is nothing to grab with a puller, I opted to grind through the inner races most of the way with a Dremel, then hit it with a cold chisel and small sledge to crack it. The race will slide right off…just be careful of flying bits of metal and be sure to use those fiberglass-reinforced cutoff wheels. Also, if you opt to get the chome-moly bearing retainer plate, you MUST measure and adjust the input shaft preloading because it does not have the relief for the outer race of the rear input shaft bearing. The instructions in the service manual are fairly straight-forward. I opted for zero end play, since most of the input shafts on the transmissions I’ve worked on get sloppy shortly after a rebuild. The new trans works great and it’s nice having my old beater back. Two months of paint peel has left the car looking as bad as ever, but it still goes like hell…. Back in early June, the trans started making a horribly loud whining noise all of the time. Prior to that I was hearing more noise than usual, but what I was hearing then definitely signaled the end of the bearings. I’m guessing that my rather heavy foot combined with copious amounts of boost caused a bit too much wheel spin, which tore up the spiders on the diff. Since we were without a garage and about to purchase a home, I limped the car the 40 miles or so to my parent’s driveway to wait out the upcoming craziness in our lives. Now that we are getting settled in our new home, it is time to deal with this thing. I have the original A520 that came with the CSX. It seems to have survived the two garage floods that occurred while it was in storage at my friends’ place. I took it apart and cleaned/reoiled it both times, so it should be in good shape. It does, however need a new #2 syncro and could also use new bearings. The spiders on the diff look excellent. I have placed an order for new bearings, snap rings, spacers, shifter fork pads, #2 stop ring, and the chrome-moly bearing retainer plate. I want to get the plate because I know the other A520 was flexing pretty bad when the Shadow hit its torque peak (let out quite a howl in 3rd gear). I am ordering the parts through Gary Donovan at Relentless Performance. Not much has changed with this car, since I have no where to work on it now. We hope to buy a house this year, so all of that will eventually change. Other than the continuing paint-peel saga, this car has been running well. The only real problem I had was when the center contact distributor cap burned off. The engine was running a little rough, which turned out to be because the spark was arching 1/4 inch from the primary to the rotor. How’s that for a strong ignition system! Next will be the transmission (the bearings are starting to howl), but I still have the spare A520 from the CSX. This car also got flooded twice last year, but I was able to dry it out and it seems to have survived OK. I installed the Conquest intercooler into the Shadow with some clever plumbing to keep the BOV. I upped to boost to 14psi and the car makes lots of power now. Performance-wise, the car is right where I want it. I picked-up a used hood from MoparChad to replace the bent one. I also got some power window and door lock motors off of the same car. The parts car was pretty rough, otherwise. The Shadow looks a lot better now, though the “new” hood needs quite a bit of work…at least it’s straight. Well I took the old hood off, threw it in the grass, and started jumping on it to straighten it out. After that and some work with pliers and wooden block, the hood was straight enough to close. The Shadow is now back as my driver, though it looks pretty shabby from the front. This past weekend I straightened out the subchassis and fixed a few broken items. These include the oil pressure light switch and the oil filter, which got whacked by the radiator fan motor and shroud when the subchassis got pushed back. Our handy-dandy hydraulic kit saved the day again. It’s just a basic narrow cylinder with various extensions and ends so that you can stick it anywhere. Works great for separating ball joints, too. Anyway, I got the subchassis back where it should be and straightened out. I also fixed the grille brackets, headlight bowl/bezel, and fender. What is left of the grill is back in place and the headlights will be fixed as soon as I get some new alignment screws. If I can’t find a grille, I may just patch-up this one and use it. It doesn’t look great, but it will get me through the winter. What I really need is a hood…I cannot save this one. In light of the hood bulge rarity, I may just put the T1 radiator from the CSX back into the Shadow and either convert back to T1 or use the Conquest intercooler setup. This would put the CSX back the way it was and allow me to use a flat hood on the Shadow. I like the look of the bulge hood, but it isn’t absolutely necessary. I’m not sure that the Conquest intercooler is any better than the stock T2 unit. It’s longer than the T2, but doesn’t have any fins in the tubes (they are just flattened round tubes). Flow may be a bit better (maybe), but I think efficiency is questionable. Also, the CSX doesn’t have A/C, so air flow to the stock IC in the stock location should be better than it is on the Shadow. I’m probably going to keep the BOV on the Shadow since it has the little Mitsu turbo. Well, it appears that my luck has run out with this car. I was traveling about 35-40 mph (in a 50 mph zone) on a dark back road near my house when a deer jumped out of the tall corn field from the left right in front of me. I slammed on the brakes and swerved to the left hoping to avoid it (it was already more than half-way across). The result was the right corner of the hood and grill caught the deer in the rear in mid-air and flipped it into the right shoulder. My hood, grille, and headlight took most of the hit, but not before it bent back the subchassis behind it. The right fender was also bent outward, but easily recoverable. 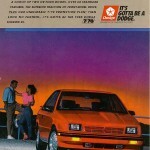 The big problem is finding an ’87 or ’88 P-body hood with a turbo bulge. I need the bulge to clear my upper intercooler hose and radiator fill cap (T2 unit). I saw a 4-door version of my car (red and all) in a yard. Unfortunately, the car and hood/grille is gone. If you know where I can find one, please let me know.